A top 10 list is always going to result in heavy debate… No matter what you say, there will always be someone who disagrees. With that in mind however, I’ve tried to make a top cutscene list that explains why I have made these choices, so even if you don’t agree with my choices, you will understand why I rate them so highly. Shadow of the Colossus may be the very definition for ‘Games as Art’; however what earned it the spot on my list is the hero’s horse and faithful companion Argo. After many hours playing the game and traversing the giant world, I’d been taking him for granted and was really hit emotionally when he throws you to safety at the cost of his own life when the bridge collapses. It’s a truly memorable moment and leads you into the final Colossi on a low point as opposed to the excitement I had been feeling prior to this. I never was one for watching the .Hack animé series but I’d always played the .Hack games. After waiting for .Hack GU, I was immediately impressed at the quality of game play and visuals over the original quadrilogy, but the series really hits you with its best moment at the start of the first game of the GU series. 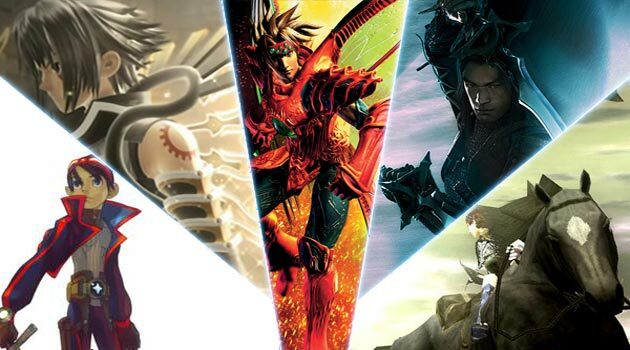 Watching Haseo get destroyed and reset to ground zero was necessary for the narrative, but the scene played out in such a way that you really feel his pain. Not just at the inability to get his revenge, but the physical pain he feels when he’s hit by the beam. To this day the games still have a visual style that I’ve not seen replicated, falling somewhere between cel shading and standard CG, but with crazy light effects making it a visual treat to watch in style and not just content. Legend of Dragoon may be known to most as Sony’s in house attempt to create a Final Fantasy game (and its one hell of an attempt at that! ), but to me it was, and still is, the ultimate Tokusatsu game. You could liken it to a Power Rangers/ Super Sentai RPG. The toku fans among you might remember Saban’s Mystic Knights of Tir Na Nog which I always think of when I play this game, given their similarities in powers, armour and setting. The cutscene I chose however, comes as a complete surprise, as up until that point there had been no real full CG scene outside of the opening sequence, and that only adds to making the scene that much more epic. While a lot of the Dragoon warriors enemies alike in the war are only ever seen in this scene, you really see how valiant they are. But it’s really important to Rose’s character growth, who survives the war and it helps you finally understand her growth over the years… not to mention throwing a curve ball into everything when you eventually meet the main villain. The Breath of Fire games are fantastic RPGs and I have a great love for the series as a whole, however the 5th game, Dragon Quatre has a lot of hatred aimed at it for breaking most staples of the series, and may have killed the franchise (Unless main character Ryu manages to rear his head in the upcoming PlayStation All Stars Battle Royale). The Cutscene however that I chose is one of the high points of the game. After your long slug through it, you actually think that Ryu won’t make it out, and having the D-Counter on display through the scene only adds to the feel of throwing your life away to save the others. There’s nothing special about how the scene plays out animation wise, but it looks epic as Ryu makes his last stand. Weather you’ve played Onimusha 3 or not, it’s highly likely you’ve seen this cutscene if you were a regular on gaming sites nearing its release. Seeming more like a mini movie than a scene, it was released as such on the internet to promote the game, and gathered a lot of attention for the realism and high quality of the animation. Knowing the effort that went into this scene makes it even more special, having Donnie Yen choreograph makes for wonderful action, as well as the CG company ROBOT doing some impressive videos. The use of real life actor likenesses also adds to the epic feel, as Samanoski’s actor Takeshi Kaneshiro looks like a copy of himself in the House of Flying Daggers. It’s a true marvel to watch and even out shined full scale movies that used the same technology, like Beowulf, despite preceding them by a number of years. The Metal Gear games may actually be the most cinematic games ever created; you generally have about a 70/30 ratio of gameplay to cutscenes (in favour of cutscenes of course), which make them almost digital movies with occasional interaction. Though that’s not to say for one second that that’s a bad thing, as Metal Gear is a magnificent series. The cutscene I chose from Metal Gear Solid 4 is the culmination of everything the series has shown you, preceding the most emotional bit of gameplay that the series has to offer as well. Snake and Ocelot/Liquid are the heart of the series, and their final standoff is 4 games worth of bitter rivalry, hatred and the greatest respect two warriors could have for one another. Final Fantasy 7 might be the most well known of all Final Fantasy games. Whether it’s the best is arguable, but given that it has been expanded into a franchise of its own, which is where Crisis Core FF7 comes from. A prequel based around the focus of Cloud’s delusion; Zack Fair. Though it also adds development to Sephiroth; showing him before he goes on his journey to destroy the world, the game presents one of the coolest scenes in a Final Fantasy game up to this point. The scene, showing a sparring sequence that gets out of hand between Sephiroth, Angeal and the game’s villain Genesis, showing him as a hero. After a nice little talking piece between the 3, they fight in a crazy Animé inspired sequence that destroys the Junon Cannon and really shows just how powerful Sephiroth is, yet in a much calmer demeanour than what we’re used to. I can’t help wondering how Sephiroth would have turned out if he didn’t go crazy at finding out the truth of his origins. Devil May Cry 3 made up for everything that was wrong with its previous instalment, and also provided us with one of the best action games on the PS2. 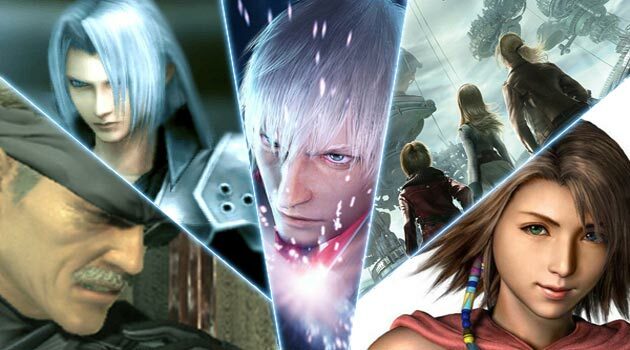 It shows us Dante in his youth acting just as cool and cocky as he did in the original game. It’s that we expect him to always be the cocky pretty boy who is generally unstoppable, that makes the scene at the end of chapter 7 so great. Dante is finally put in his place. With all his talking and ability, he’s just no match for his brother, who’s in a higher league as someone who’s accepted his demon side. Virgil is Dante’s match and opposite in everything, and how they play off each other in this scene shows how they’ve had this rivalry since they were young, and have finally met as true enemies. It offsets the rest of the game nicely, as after this, once again you see that Dante isn’t the strongest guy around, and needs to accept the demon inside of him that is drawn out at his defeat. I don’t have much love for Final Fantasy X-2. A sequel made purely for the money it seems, enabling them to re-use half the assets made for Final Fantasy 10 to churn out a FF game in record time! Yet somehow this game ended up with a scene so emotional and well played, that it almost makes up for the whole game being disappointing. The song 1000 words is a complete contrast to the rest of the game and is sung well enough that you start to feel for the characters, especially the villain of the game in a way that you probably didn’t think you could up to that point. It reminds you that the story for this game is love themed and at its heart a tale of tragedy… something that the rest of the game could have played up to be potentially the most emotional FF game ever… but it didn’t. Yet this cutscene shows us what could have been, and I’m more than happy just to make 3 minutes of perfection, then a game of mediocrity. Finally we have Resonance of Fate, or End of Eternity depending on your region. This is a wonderful RPG that breaks the mould of what we expect from the Japanese RPG. You expect crazy hair, big swords and turn based action. Tri-Ace gives you customisable characters, machine guns and a battle system resembling a John Woo film, but full of depth and strategy. The writing of this game just makes every scene so much fun, and the delivery of the lines only adds to the charm. With the game following an episode fashion like a TV show, each chapter introduces new crazy characters and situations. The introduction to chapter 2 shines out as my favourite cutscene of all time, not for action, but for the most well paced writing and comedy I’ve ever seen in a game. This is something that I continue to re watch now, and show as examples of great narrative, flow and comedy, despite knowing so little about the characters at this point in the story. So how about you? What are your favourite cutscenes of all time? Share them with us in the comments below, and let’s make this an extensive resource of the best game cutscenes to date! Very unique list. I’ve only experienced 3 of them, but they’re understandable choices! You mentioned X-2, but one of my favorite scenes is in Final Fantasy X. The end cutscene (which I won’t reveal for anyone who hasn’t played it) is one of the most powerful scenes I’ve ever seen, and the wonderful musical score amplifies that power to make a beautiful ending to a wonderful game. FFX does alot of things right, with the most important being the build up the scene you mentioned. FFX-2 on the otherhand does alot of things wrong, especially in narritive and that makes the 1000 words scene game defining in its own right compared to FFX where that scene is the climax of a games worth of build up, not quite as powerful without the setup. I definitely see your point. FFX definitely had a very powerful story, which required all that build up to make the impact it did at the end (which is why it’s on of my favorite games of all time). Though FFX-2 certainly had it’s flaws, I felt the end redeemed it in a way, and that it brought some closure that was lacking from X.
I still watch the ‘1000 Words’ cutscene from FFX-2, years and years later. I think there were some true classics that were missing from the list. One that comes to mind is Lucas Arts Full Throttle. The cartoon like graphics were great for their time and its the only game where i can say I have never skipped the intro. Ben’s gravely voice over leading into the Main theme perfomed by the Gone Jackals was pure cinematic gold. The intro for Full Throttle certainly gets you pumped for playing the game but it never really goes anything beyond that. Its just keeping you entertained through the credits, not really striving to create any sort of emotion in the player outside of the feel good factor. While I never considered that game for the list I did consider the opening of Boarderlands for a while which does the same style of intro, with the cartoon style and awesome music it seemed like a recreation of that opening in spirit.